How long these beautiful restorations last depends a lot on how well you take care of them. The porcelain itself wears as well or better than your natural teeth. The bond between the laminate and the tooth is very strong. The porcelain is also immune to tooth decay, however, the uncovered part of the tooth is still susceptible to decay, so you can get cavities with veneers. If you consume carbohydrates frequently between meals, or if you do not floss and brush diligently, you will have a greater chance of this happening. If you take excellent care of your teeth, they will last many long years. It would be best not to think of them as being permanent—think of them as lasting ten to twenty years with good care. After porcelain veneers are placed, we often notice that the health of the patient’s gums improves. In some cases this is because the teeth now have a more ideal contour that tends to lend to healthy gums. In other cases, it is because the patient, who now has beautiful teeth instead of unsightly ones, has a greater motivation to take care of them, much as the owner of a nice car will take pride in washing, maintaining, and protecting it. If you do happen to notice that your gums become puffy or begin to bleed around porcelain veneers, or if you notice an area that begins to snag floss, it’s an indication that something is amiss. Please have your dentist check either of these situations. To maximize the lifespan of your investment, we recommend special professional maintenance techniques. Be very careful who you have maintain them and what they do. Hygienists who don’t have special training in the maintenance of porcelain veneers will not know what needs to be done to keep them looking their best. We recommend maintenance visits up to four times per year when you have a new smile with these restorations. This will give the dental office an opportunity to keep the margins polished, thus prolonging their life. But not all cosmetic dentists will recommend this. The resin used to bond the porcelain to the teeth can be susceptible to stain. Staining and deterioration is accelerated by alcoholic beverages, which soften the surface of the resin. Also avoid highly abrasive toothpastes. While they won’t scratch the porcelain, they can cause the bonding resin to be abraded. 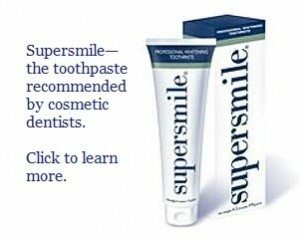 A toothpaste that is an excellent cleaner and is also gentle is Supersmile whitening toothpaste. It is available from cosmetic dental offices, but not from stores. Check this link for information on how to purchase Supersmile. Porcelain veneers are not designed to withstand sharp impacts and they can fracture, just as your natural teeth can fracture. Do not bite pins, nails, bottles, etc., and do not strike them with hard objects. If you engage in contact sports, wear a mouth protector. Brush and floss faithfully. Keeping them clean is your best insurance. I recommend Supersmile whitening toothpaste when you have porcelain veneers. When I was in practice, I gave every smile makeover patient a free tube to start them off, because I felt so strongly about that. It keeps the stains off, but it is gentle and won’t scratch your beautiful dental work. Avoid frequent snacking, which is the single greatest factor promoting tooth decay. Vibrating sonic toothbrushes are excellent for caring for porcelain veneers. Some people get confused because I caution about the use of ultrasonic scalers, and they think that warning applies to sonic toothbrushes. But ultrasonic scalers have metal tips that vibrate at ultrasonic speeds. Their problem is that they can nick the margins of porcelain veneers and dental bonding if they aren’t used carefully. Sonic toothbrushes, on the other hand, have soft bristles that vibrate, and their effect is to clean and polish the veneers or bonding. Click here to read more about sonic toothbrushes, which I recommend. Click here where I respond on our blog to someone who had heard that sonic toothbrushes shouldn’t be used on porcelain veneers, which is not true. Avoid excessive alcohol consumption and the use of alcohol-containing mouthwashes. Alcohol will soften the bonding composite that holds the veneer to the tooth. It won’t make the veneer become loose, but it could make that bonding line become more susceptible to deterioration and staining. Never use a Prophy Jet or other power polishing equipment. The porcelain will look great at the end of your appointment, but you will have removed the glaze and the veneers will start to stain when your patient gets home. With the glaze intact, porcelain is very resistant to stain. Be careful with the use of an ultrasonic scaler on teeth with porcelain veneers. There is a potential to nick and chip the margins if your motions aren’t smooth. Don’t dwell on the margins of the porcelain with your instrument. If you want to give a fluoride treatment, use neutral fluoride, never acidulated fluoride. The acid in acidulated fluoride is hydrofluoric acid, which etches porcelain. It will have a similar type of effect to the Prophy Jet and will leave the surface of the porcelain somewhat rough and susceptible to staining. It will also remove any tints that were placed in the surface of the porcelain by the laboratory technician and thus alter the color of the porcelain. Use a gentle prophy paste. An aluminum oxide paste like Cosmedent’s Enamelize is perfect. If you don’t want to use that, at least stay away from coarse pumice polishing pastes. Be careful with heavy-duty scalers on the margins. They can also cause nicks and chips. Check our referral page for a list of cosmetic dentists screened for proper training in providing expert porcelain veneers. Porcelain veneer techniques and smile design are not generally taught in dental schools to general dentists—a dentist needs extra post-graduate training to deliver this level of care. The dentists on our referral list are all artists and have had that extra training. E-mail Dr. Hall if you have any other questions about porcelain veneers. Check our porcelain veneers page for more information about what porcelain veneers can do for you. If you have questions about whitening toothpaste, we have the answers. Click here to see porcelain veneer pictures featuring the beautiful work by some of the expert cosmetic dentists we recommend here. See the Cosmetic Dentistry Blog where I answer a question about porcelain veneer maintenance for a visitor.